I think it’s illegal to write anything about buoyancy without telling the story of Archimedes. So here goes. 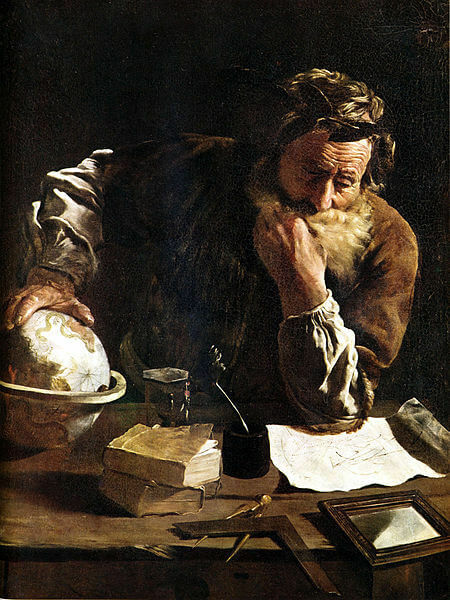 Archimedes was a scholar who lived in Greece in the 200s BC. As the story goes, the king of Syracuse gave a local smith some gold and requested that it be turned into a crown. When the crown was finished, the king suspected that the smith had kept some of the gold for himself, replacing the stolen quantity with silver, which was much less valuable. Luckily for the king, there was a person in the kingdom who is recognized today as one of the greatest scientists, mathematicians, and inventors of all time. The king went to Archimedes and asked him to sort out the whole crown situation. The crown was found to have the correct weight, but the smith could have put in just enough silver to match the weight of the missing gold. However, gold was known to be almost twice as dense as silver – in other words, one piece of gold would weigh about twice as much as an equal-sized piece of silver. So if the smith had indeed cheated, the crown would be bigger than expected – specifically, it would have a greater volume. But nobody could figure out how to determine the volume of a shape as strange as an intricately-wrought crown. They could melt it and re-shape it into a nice cube (and just multiply length x width x height), but then the crown would be ruined. Archimedes is said to have solved the problem while having a bath. As he got into the water, he noticed the rising water level. He realized that to find the volume of an irregular object, you could place it into water and measure how much the water level had risen – that change in volume would be equal to the volume of the object. He leapt out of the bath, shouted, “Eureka!”, which is Greek for “I’ve found it!”, and ran dripping and naked through the streets of Syracuse. Because this story was written two hundred years after Archimedes’ death, and because he probably didn’t have the tools necessary to make accurate enough measurements of the density of the crown, it is now thought that things didn’t happen exactly like this.1 Instead, he probably made use of what is now called Archimedes’ principle. Archimedes’ principle explains very well why different objects float or sink. 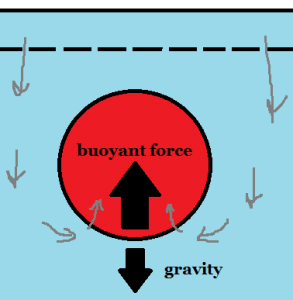 It says that the buoyant force on an object in a fluid is equal to the weight of the fluid that has been displaced by the object. In other words, if you put a beach ball underwater, there will be a buoyant force pushing it up, and this force will be equal to the weight of a beach-ball sized amount of water. Homemade diagrams are the best diagrams. The beach ball floats because this buoyant force, caused by water pressure, is stronger than the force of gravity pulling down on the ball. Now imagine filling that ball with sand instead of air. It will still displace exactly the same amount of water, so the buoyant force will be exactly the same as before. But it will now sink – this is because its weight (gravity) is now greater than the buoyant force holding it up. And how could you get all that sand to float? You’d have to put it inside a much larger object – something that would displace more water and therefore have a greater buoyant force – but it’d have to be something that doesn’t add a lot of weight to the situation. As you can see, it’s not weight alone but density – weight divided by volume – that determines whether an object will float in a fluid. Boats make use of Archimedes’ principle by having large bottom halves that displace a lot of water in order to generate enough buoyant force to support their weight. Blimps use this principle as well – they hold a less-dense gas, like helium, in a large volume and float on the buoyant force provided by the air. If you took a boat or a blimp and squished all the materials together so that they became more dense than water or air (respectively), they would no longer float. This also explains why you float more easily in salt water (like the ocean) than in fresh water (like a chlorine pool or a river). When salt dissolves in water, it increases the water’s density. Because you’re displacing a more dense fluid, you experience a greater buoyant force than you would in fresh water. 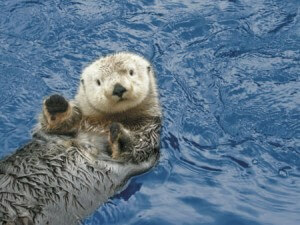 Also, you may be an otter. So to solve the problem with the crown, Archimedes probably performed the following experiment: first, he tied the crown to a string and hung it into some water. Then he used another string to hang the correct amount of gold into the same water, and hung both strings from either end of a stick. If the crown and the gold had the same densities and volumes, they would also have equal weights and equal buoyant forces, thus balancing each other perfectly. If the crown was lighter in water, that would mean it was displacing more water and thus did not have the correct density, in which case the goldsmith would be in a whole mess of trouble. According to Archimedes’ principle, the buoyant force on an object is equal to the weight of the fluid that the object displaces. An object will float in a fluid if it is less dense than that fluid. A boat made with dense materials like metal can float on water because the materials are shaped into large, air-filled volumes.